The Federal Republic of Germany, a.k.a. 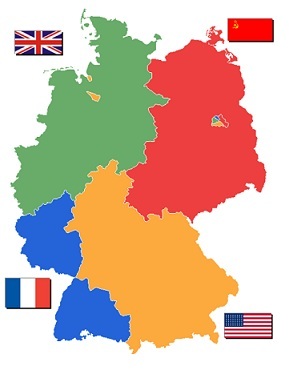 "Bundesrepublik Deutschland", "BRD" and "West Germany", was established from eleven states in the three Allied Occupation Zones held by the United States, the United Kingdom, and France. The city of Bonn was its provisional capital. The three Allied Occupation Zones making up the territory of the Federal Republic are shown in blue, green, and yellow on the map at the right. The area in red would eventually become the German Democratic Republic, a.k.a "Deutsche Demokratische Republik", "DDR", and "East Germany", under Soviet influence. The Federal Republic was founded on May 23, 1949 and was declared "fully sovereign" on May 5, 1955. The Western troops remained there as part of the North Atlantic Treaty Organization (NATO) which West Germany joined on May 9, 1955. The foundation for the influential position held by Germany today was laid during the "Wirtschaftswunder" or "economic miracle" of the 1950's, when West Germany rose from the massive destruction inflicted up on it by World War II, to become the World's third largest economy. The set of stamps shown in the scan above was the first official postage stamp issue of the Federal Republic. They were issued on September 7, 1949 to publicize the First Federal Assembly, and they depict an allegory of "Reconstruction". The postage stamps shown above were issued on September 15, 1956. 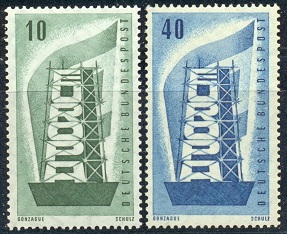 The stamps depict a symbolic representation of the Reconstruction of Europe, and they were issued to symbolize the cooperation among the six countries comprising the Coal and Steel Community. This organization would eventually evolve into the European Union. Since the reunification of 1990, the government of the Federal Republic has moved back to Berlin, and the parliament now meets in the Reichstag Building. The new, unified nation is now known as "Deutschland" or "Germany". 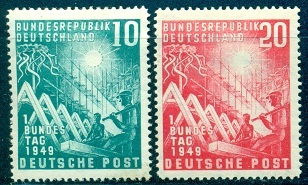 Historical articles and reviews of the postage stamp issues of the Federal Republic of Germany will eventually appear in the link section at the top of the third column on this page. The content of the page links in this category will be presented, per the Michel catalog, with Scott catalog cross-references. Link page categories are segregated by being either "Definitives" issues pages or "Commemoratives" issues pages. Charity stamps and special issues, what the Scott Catalogue refers to as Semi-Postal Stamps, will be found within the "Commemoratives" link pages at the upper right.